You can now research your Friends’ cues (including cues from subscriptions) by tag and realm on the Cues>Friends’ Cues page. 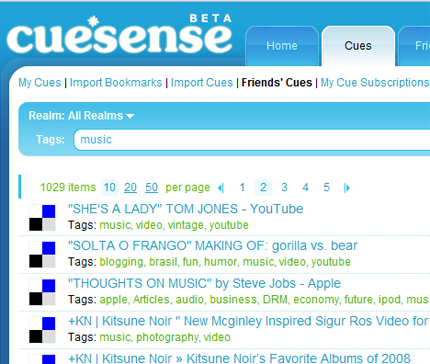 Every public cue source in CueSense has now a dedicated profile page that lists its cues, clicks, tags and subscribers. When you create a subscription to a cue source, you also automatically establish a public feed accessible to everyone. To find interesting public feeds, check out the Explore Feeds page. Feeds are grouped into Feed Topics based on the most popular topics assigned to them by CueSense members. When someone sends a friend connect request to you in CueSense, we will send an email reminder to you as well. Previously, we used the Subscription ID as the title of the feed, which did not work too well for Blogs and Flickr accounts. We will now extract a more readable name from the cue source and use it as display name. For existing subscriptions please open the Edit dialog and save it for changes to take effect. Click on a column in the Trend graph and will open the Friends’ Cues filtered by the corresponding date and tag.